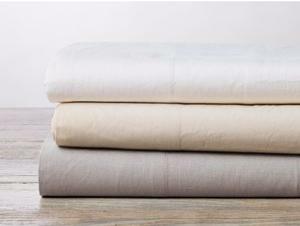 Percale Sheet Sets, crisp and airy. Certified organic cotton 300TC that is cool against the skin, perfect for warm nights—or warm sleepers. Elegant 7" attached hem finishes the flat sheet and pillowcases. Fitted sheet features a 15” pocket. Cotton sourced and woven in India. Sheet Care.